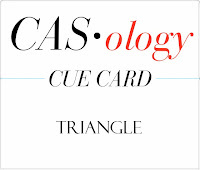 This week's CASology Cue Card is Triangle! I really wanted to emphasize the rich red of this AMuse Santa's hat (which is almost a triangle!). But I also wanted to create a little interest, so I popped up the panel and edged it in the same stickles that I used for the trim on the hat. I'm not going to lie - it takes good eyesight and/or bright light and a steady hand to get the stickles right on the edge of the card. And it will warp as it dries, but it flattened out again on its own once it was completely dry. But the look is so sparkly and festive, it's worth the effort and the time. 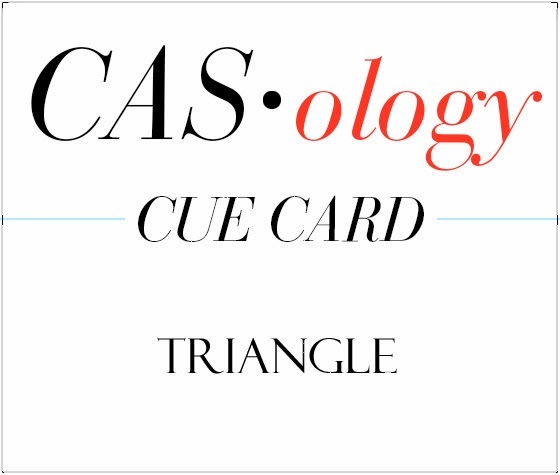 Now it's your turn - triangles are very trendy right now - can't wait to see where this week's cue card will take you! One word, repeated X 1,000: LOVE!! I love this Ardyth, so clever and beautiful! Love this - you did an outstanding job on the Stickles. Yay for you. So clever! I wish I'd thought of this! Yep...pure Ardyth cleverness right here. Amazing what a little sparkle does to a card, eh?! :) Love how that bright red hat just pops right off the card despite its small stature! Love this!!! oh my word~too too cute! This is fab! Love Santa's hat and the sparkle too! Fabulous. Love how you did the stickles, and fabulous coloring and shading of Santa's cap. Another unique card Ardyth. The cards for your nephews were oh so original - just like you. HA! Leave it to you to figure a triangle from the hat! You are so amazing in your out of the box thinking! I guess 'brilliant' is the most appropriate word for this my friend! I seriously don't think this could be any cuter! so fun to focus on Santa's tiny red hat Ardyth! love the sparkle edge on hat and panel! Love your 'triangle'! I'm totally impressed with your stickle border! The second I read 'steady hand and good eyesight' I knew I was hooped because I usually wear two pairs of reading glasses to do normal card work! Only YOU could be this creative and it is wonderful! So cute and clever, Ardyth! I love that you added stickles around the perimeter of your front panel, too! Can you say Ho Ho Ho? Love your jolly Santa hat representing the triangle...so smart Ardyth! All that glitter along the edges really sparkles with the white on white! So adorable, Ardyth. I love A Muse stamps..they're always so cute. Hope my email to you about the stamp got to you and didn't go in your spam. Perfect Ardyth! 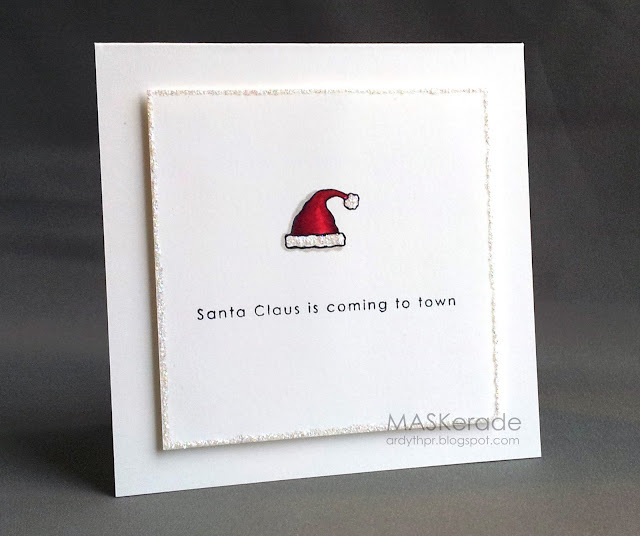 Love your card and your coloring ….the way you shaded the hat with a bit of shine or shadow. Simple is best! this is great! so CAS!!! i wish i could create such CAS cards so beautifully! im adding you to my list of blogs that inspire me ;) thanks so much for being so awesome and inspiring! Ardyth, what beautiful shading on that rich Santa hat (yep, it's a triangle, alright!) and that sparkly border is perfection! I adore the perfect symmetry of this card...wonderful! Cute take on the triangle! So cute - and clever. Love the glitter edges!